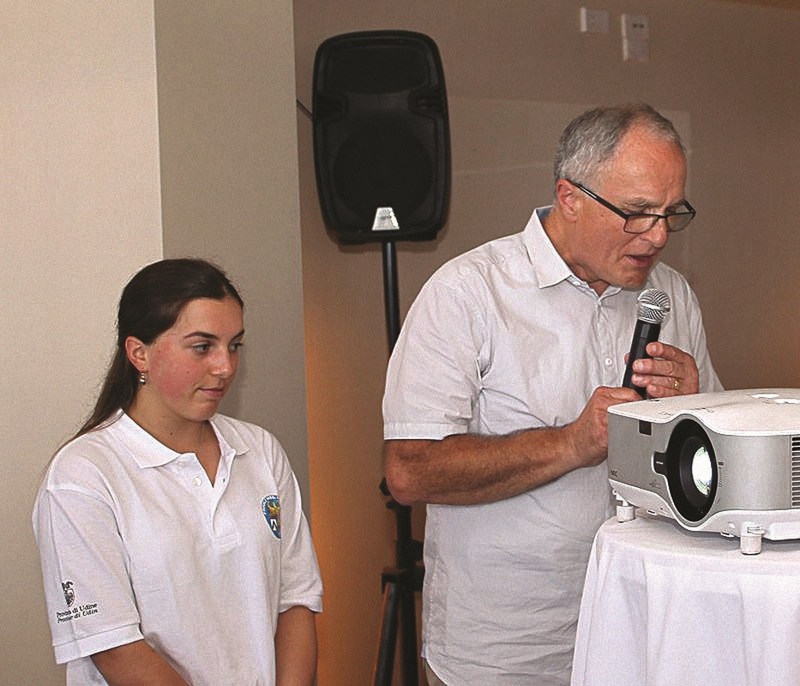 The MY NONNI initiative was launched in Sydney by Federico Martin and his 14-year-old granddaughter Gabriella Sakkos, who were guests of honour at the Carnia and Friuli Day celebrations, organised by the Fogolar Furlan Club NSW. Welcoming the guests of honour was Angelo Donati, president of the Fogolar Furlan Club NSW, who declared his pleasure in taking part in the event. “It has been years that I have dreamt of this moment, in which Friulian culture finally has a real chance of continuing on after us, with the release of the initiative MY NONNI,” Donati said. Taking the floor at the project launch was Fred Martin, representative of the Fogolars Furlans of Australia association, who affirmed “this initiative directly encourages the grandchildren of Friulian immigrants of the post-war period to speak with their grandparents and consult them on their life experiences”. Fred said that the initiative was sparked when his granddaughter demonstrated herself to be extremely curious about his life in Italy before departing for Australia, about his early work experiences in Australia, the formation of his family, and so on, thus traversing the arc from childhood, fatherhood and now as a grandparent, and from all this, producing a beautiful small book. Gabriella said that the initiative was informed by her curiosity for Friulian culture, which seems to play such an important part in the life of her grandfather and from which she had drawn a lot of pleasure. “I did it because I love my nonno, I like hearing the story of his life and especially of his first years in Friuli, before coming to Australia and in this way I understand better who I am,” she said. The initiative serves to fill that emptiness which the Friulian emigrants from the post-war period experienced, after their children failed to demonstrate the same enthusiasm for their old culture. These emigrants expected a transmission of Friulian culture which came about in the same way as every tradition, with knowledge passed from father to son and mother to daughter, as it happened in their memories of their Friulian families. But this tradition came in conflict with two unexpected obstacles: a changed world and a nation, Australia, whose culture and traditions at times seemed to clash with family life experiences from Friulian culture. The missing transmission to the new generations has been a source of anguish perceived by many immigrated ethnic communities in Australia from the post-war period. A desire instead to know these cultures and traditions is increasing only now, amongst the latest generations... the grandchildren. Both because school encourages them, and because the affection of the family renders them avid to know more, and because perhaps unconsciously, these kids are in search of their identity, reality demonstrates that they want to be better informed about their origins. That the idea has sprung from the spontaneous curiosity of a 14-year-old, we believe and hope is not the tip of a solitary iceberg. The initiative will be proposed to the presidents of the Fogolars Furlans of Asutralia Association, at the next meeting at the end of June. The Fogolars Furlans Association of Australia was created last October, on the initiative of Fred Martin, with the participation of all the Fogolars of Australia: Sydney, Canberra, Melbourne, Perth, Brisbane, Adelaide, Dimbulah and NSW. 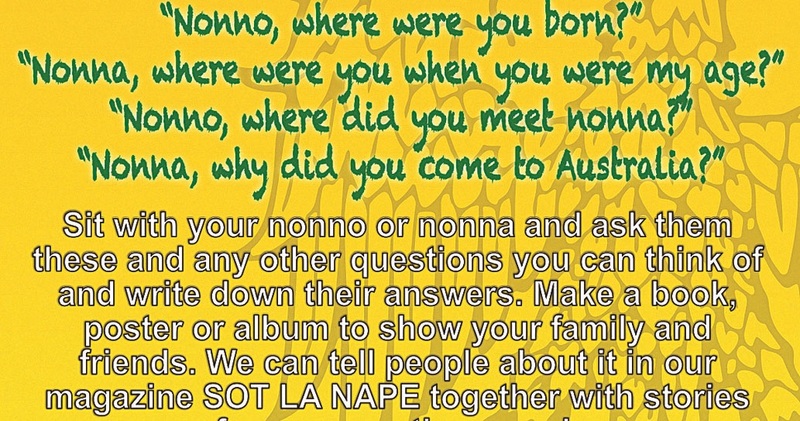 At that meeting it was also proposed, to unanimous acceptance, that the magazine of Fogolar Furlan NSW, Sot La Nape, was adopted as an instrument of communication for all the Fogolars of Australia. 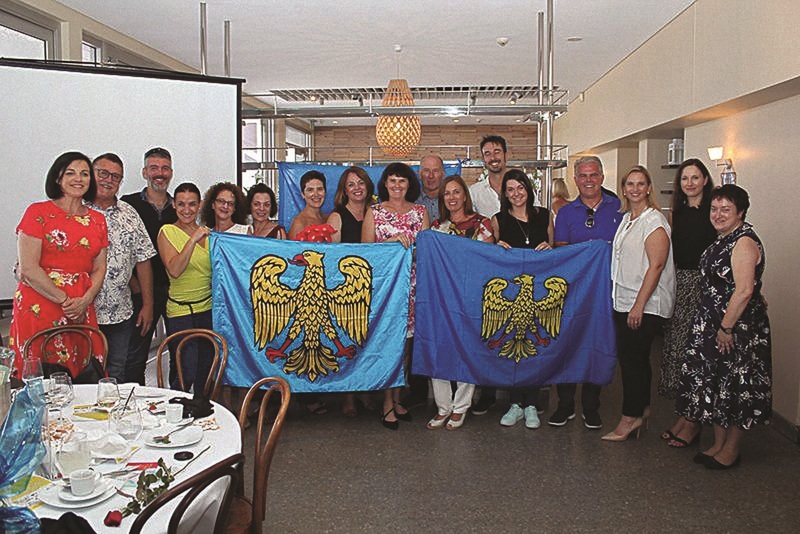 The celebration of Friuli and Carnia Day, which happened last Sunday, was an initiative of the Fogolar Furlan Club NSW. A hundred emigrants of both early and recent arrival, including family members and friends, celebrated the anniversary in a restaurant on the coast at Sans Souci, with everyone included in the pleasure of feeling particularly Friulian, even while at a distance of thousands of kilometres from the Little Country. Lucio Rupil, vice-president of the Fogolar Furlan NSW, was the experienced MC while Mirella Riga, secretary and treasurer, cooperated with Susie Casali and Vivian Bonanno-Chapman to organise publicity, menu and decoration of the room, and, as always tireless work for every need. A brochure designed by Daniel Vidoni about the MY NONNI project, captured in a mischievous way the innocent curiosity of the little ones who ask their grandparents why they know more than their own parents. The brochure was applauded by all present. Indeed, it coincides with those fixed points of almost every culture, and certainly the Friulian one, in which it is rendered difficult to resist a grandchild who wants to hear the stories of their grandparents. This is a personal project for every grandchild, but also every family. It is not, however, one of the umpteenth stories recounted or written by grandparents or others. It is not a university research assignment. These will be stories instigated by the curiosity of the grandchildren. They could result in printed volumes, filmed videos, collages, posters, or any other type of production chosen by the grandchildren. The project will be publicised in the magazine Sot La Nape. John Colussi, editor of Sot La Nape, emphasised that the magazine is not a club bulletin, but a publication dedicated to divulging, supporting and promoting Friulian culture in all its expressions. It encourages written and photographic contributions from whomever wishes to recount personal or familial happenings, stories of Friulian success, a memory from a visit to Friuli, a comment on the lifestyle in Australia, and so on. This wide vision has been expressed by project creator Angelo Donati, who surrounded himself with people who were share his enthusiasm for the idea and its implementation. In this way, 13 editions later, the magazine seems to have adhered to this idea, and is now a strong tool of communication between all the Friulians of Australia. For information, get in touch with Mirella Riga via email or by calling 0403 608 083. This story appeared in the Monday April 1, 2019 edition of La Fiamma.